2 Pizzas consisting of a pizza base with tomato sauce and topped with a four cheese blend of mozzarella, Edam, red Leicester and mature Cheddar cheese. Two pizzas with tomato sauce and topped with a four cheese blend of mozzarella, Edam, red Leicester and mature Cheddar cheeses. Wheat Flour (Wheat Flour, Calcium Carbonate, Iron, Niacin, Thiamin), Four Cheese Blend (31%), Water, Tomato Purée, Semolina (Wheat), Tomato, Rapeseed Oil, Yeast, Salt, Onion Powder, Black Pepper, Oregano. 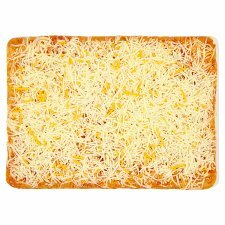 Four Cheese Blend contains: Mozzarella Full Fat Soft Cheese (Milk), Edam Medium Fat Hard Cheese (Milk), Red Leicester Cheese, Mature Cheddar Cheese (Milk). Instructions: Place one pizza directly onto the top shelf of a pre-heated oven and one pizza directly onto the middle shelf, for 12-14 minutes. Swap over the shelves halfway through cooking.